Follow the progress of Daisy and her kittens over the next few months with our kitten watch series. Daisy who gave birth to four gorgeous kittens at Cats Protection’s Bridgend Adoption Centre is proving to be the purrfect mum. She is taking excellent care of her litter and quickly responds to each kitten’s calls with soft meows and reassuring chirrups as she tends to their every need. In return the volunteers and staff at the centre have made sure Daisy is receiving excellent care herself, and this week took her for a check-up at the vet. There she had vaccinations to protect her against cat flu herpes and calici virus (FHV, FCV), feline parvo virus (FPV) and feline leukaemia virus (FeLV), all common but sometimes fatal feline diseases. To find out about the importance of getting your cat vaccinated, visit the Cats Protection website. Meanwhile, the kittens; Dewi, Emma, Eira and Daffodil, have more than doubled in size since birth and are gaining around 10 grams a day. Their fur is also growing longer and their ears are almost fully upright, so they are starting to respond to sounds. The kittens’ eyes, while still blue (they won’t change colour until they are around six weeks old), are now completely open but their vision will be a little blurred as it is still developing. They incisor teeth are also starting to come through, and their sense of smell is getting stronger as they will hiss at any smells they find strange. The kittens are still feeding from their mum (they will begin weaning at three to four weeks old) but are more mobile and starting to crawl away from Daisy to explore their surroundings and interact with their siblings. 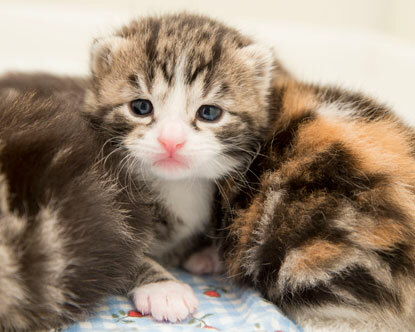 Over the next few weeks and months, we will keep you updated on Daisy’s and her kittens' progress, but if you would like to help towards the cost of her care at the Bridgend Adoption Centre then you can sign up to become a Cats Protection sponsor. Daisy is one of our many sponsor cats, so from as little as 19p a day you can sign up to help us provide her with the shelter, food, medical care and love she needs and receive regular updates about her and the other cats you are helping in return. Alternatively, if you would like to make a one-off contribution to Daisy's care, you can donate via Bridgend Adoption Centre's Just Giving page. 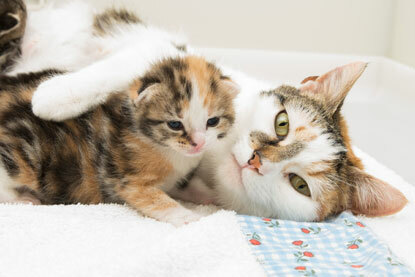 Although the arrival of kittens is exciting, giving birth can be incredibly stressful for a cat and the kittens would need to find new homes, so we recommend getting them neutered from four months old. There are already thousands of cats waiting to find loving homes across the UK, so neutering is the most effective way to reduce the number of unwanted cats coming into our care. To find out more about the importance of neutering, visit the Cats Protection website. I wonder why they can't nurse from their mama till 6 weeks?